The Rock of Cashel, also known as Cashel of the Kings and St. Patrick's Rock, is a historic site located at Cashel, County Tipperary, Ireland. The picturesque complex has a character of its own and is one of the most remarkable collections of Celtic art and medieval architecture to be found anywhere in Europe. 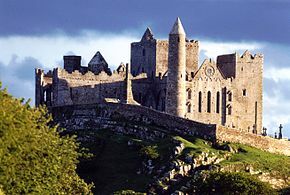 This article uses material from the Wikipedia article "Rock of Cashel", which is released under the Creative Commons Attribution-Share-Alike 3.0 License.